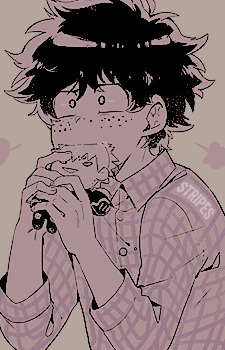 That photo of Deku is way too adorable. I like your profile very much. I just wanted to tell you that I love the aesthetic of your profile and lists! Ahh, not to worry! I'm not all that great at replying myself (although I gotta admit I do like the interaction!). It's just that I leave home for work, get home, be social and have meet-ups with friends and try to watch some anime and just log on to track those hahaha. I forget to do much else, haha! I KNOW. I had them all saved on my computer, and these ones uploaded to MAL (and now also to imgur just in case, because I recently totally wiped my laptop and did a clean install... AND I FORGOT TO BACK THOSE FILES UP :( that's the story of how I lost the second set, it was pink, and probably also original art~). It's a shame. A TOTAL SHAME. But, alas, I am still in love with the current signature, hell, I'm not even signing in to the image secret santa, BECAUSE OF THAT REASON haha. It really never tires to look at the signature <3<3<3 Did you sign up for the secret santa this year? The original art for the forum set looks so sweet and innocent. It's totally not disappointing, but I though; if they are from anime, I just NEED to watch it. I think as long as the iconic bits were animated well (KvD v2) then I was happy with it, looking back I’d maybe give it an 8/9 but I just can’t get over Kacchan v Deku. Also the next arc is my favourite so if it’s done right I can see season 4 being my favourite season so far! I do agree on that S3's later half was a bit weak, especially because they added not just one, but two filler episodes, one that was just an advertisement for the movie. But the first half is brilliant and some of the best anime watching I've had in a while! the festival, Gentle and La Brava were great, I really hope we'll see those two again! I also enjoyed the mini make up exam arc before that, I remember Bakugo said something in it that really solidified that he's continuing to undergo major changes in his character. I've been letting the recent arc chapters pile up before I continue reading. It is a nice break to see Class B again after not seeing them for a while. I'm really appreciating that it is actually introducing and fleshing out the remaining students that we didn't much of before! Are you crying everyday while you wait for S4?! Well yeah, it’s not like you write long posts that often (that I see), but your answers tend to seem more interesting to read all the same. It’s more of a general demeanor and approach to topics that you don’t see as often with the randoms. It’s kind of hard to put in words. But I like it, so keep it up! Haha. Yo. It’s been awhile. ‘Just wanted to throw out there that you’ve really turned into one of the better AD regulars over time. It’s not often that “new” people start producing reads I enjoy as much as Pullman’s and jal’s. Thanks for putting in the time/effort. Just wanted to drop by and compliment your Deku pic! This information has helped cure my curiosity. Thank you.